Dr. Samuel Miller, Professor of Ecclesiastical History and Church Government at Princeton Seminary wrote confidently in 1835 “Presbyterians do not observe Holy Days.” 1 Yet some 164 years after the book in which Miller made that bold declaration was published, an informal survey of 30 churches in the Presbyterian Church in America, the largest of the theologically conservative Presbyterian bodies in the United States, indicated that 83% of the churches do regularly celebrate Holy Days. What happened in those intervening 164 years? Did the practice of Presbyterians change significantly in that time or was Miller’s declaration inaccurate when he made it? What might have brought about such a radical change if it did in fact occur? This essay will seek to answer these questions. Because of space constraints, considerably more time will be spent examining the history of the development of Presbyterian practice in the United States regarding Holy Days than in examining the theological foundations for that practice. Nevertheless, it is appropriate to begin by discussing the theological reasoning behind Dr. Miller’s declaration. The light of nature showeth that there is a God, who hath lordship and sovereignty over all, is good, and doth good unto all, and is therefore to be feared, loved, praised, called upon, trusted in, and served, with all the heart, and with all the soul, and with all the might. But the acceptable way of worshiping the true God is instituted by himself, and so limited by his own revealed will, that he may not be worshiped according to the imaginations and devices of men, or the suggestions of Satan, under any visible representation, or any other way not prescribed in the Holy Scripture. In accordance with their beliefs, the Puritans attempted to ensure that only those elements that were directly instituted by God were present in their worship. Such worship was distinctively different from that of other Protestants such as the Lutherans and Anglicans, who tended to believe that true worship consisted of that which was commanded by God and anything which was not specifically condemned. Accordingly, outside of the Puritan wing of the Reformation, many innovations in worship that had been adopted by the Church since the closing of the Canon were retained. The fact that the Anglican church in particular retained many of these innovations is particularly important, because it was in the attempt to thoroughly reform the Church of England that the majority of the Puritan battles were waged, and it was out of these battles that the Presbyterian Confessional Standards came. Amongst those innovations that continued to be practiced by the Anglican church after they broke with Rome, was the observance of what had come to be called the Church Year. The Church Year consisted of a series of festivals or feast days on which the church traditionally held special worship services and employed particular liturgies. While feast days were most commonly held to celebrate the birth or martyrdom of a Saint, the two most popular feast days in the Anglican Church were undoubtedly Christmas and Easter, which celebrated the birth and resurrection of the Lord Jesus Christ. The Puritans did not observe Christmas and Easter because they did not wish to celebrate the birth of Jesus Christ, but because they believed that God had instituted a cycle not of two special feast days, but of fifty two holy days on which to glorify Jesus Christ and to preach on the importance of his birth, death, and resurrection. For the Puritans, these Christian Sabbaths were the only days that were specifically set aside by the Lord for worship. There had indeed been specific feast days apart from the Sabbath in the Old Testament period, but the Puritans felt that these feast days were part of the Ceremonial Law, and as such had passed away when Christ, the reality which they foreshadowed, appeared. The Sabbath, on the other hand, as both a creation ordinance (cf. Genesis 2:2-3) and part of the Moral Law (Exodus 20:8-11) was an occasion to be observed by all of the people of God throughout all the ages. Part of the proof for the Puritans that new feast days were not to be created and observed was the fact that they had not been invented or observed by either the Apostolic or the early Church. The Scriptures contained no references whatsoever to the actual dates on which the events which were later celebrated were to be observed had occurred. The church did not begin to seriously conjecture as to when these events had taken place until the third century AD and it was not until the fourth century AD that the church began to celebrate the feast of the nativity (Christmas) for instance. The placement by the church of this event on December 25th had less to do with the date they felt was most likely for the birth of Christ, than the desire to undermine the celebration of the Saturnalia, a pagan festival beginning on the December 17th, with a rival Christian holiday. The choice of December 25th, the winter solstice, was made because the Roman Emperor Aurelian, had decreed in 274 AD that December 25th was to be kept as a public festival in honor of the Invincible Sun.3 The choice of the 25th was therefore both an attempt to challenge the Pagan feast day and to maximize on the obvious metaphor between the “invincible sun” of Roman Paganism and the “Invincible Son” (Jesus Christ) of Christianity. While the Reformers in the Anglican church corporately decided to retain these holy days in 1562 and endeavored unsuccessfully to gain control of them, the Puritans decided to strike them from their calendars entirely for the above stated reasons. As was to be expected, many of the common English people and Anglican clergy, were not at all happy with this Puritan suppression of “their holiday.” Consequently, after the death of Cromwell and the restoration of both the King and the primacy of the Anglican Church, the celebration of holy days was once again declared legal. Their celebration returned as a permanent part of both the English secular and ecclesiastical landscape. In Scotland however, the Reformation was more thoroughgoing and the Presbyterian Church successfully purged holy days almost entirely from their landscape. All English attempts to reintroduce them failed miserably, and indeed Scotland was not to officially recognize Christmas as a holiday until the 1950s – by which time the influence of the Presbyterian church on Scotland had long since been waning. Before the short-lived victory of the Puritan armies in England, many Puritans had despaired of reforming the Church of England. By the early sixteen hundreds the struggle to reform the Anglican church had been going on for over half a century with little or no success. Every English monarch since Henry VIII had resisted, suppressed, or martyred the Puritans. After years of suppression and ecclesiastical maneuvering by Elizabeth I, Puritan hopes for reform were rekindled with the accession of James I to the throne of England. King James was a Scot who had been trained by Presbyterian tutors, so it was hoped that he at last would be the monarch who would bring in a thoroughgoing Reformation of the English Church. These hopes were cruelly dashed however, when it became painfully apparent that the new King despised the Puritans and was insistent on preserving or even strengthening the existing status quo in the English Church. For many Puritans this was the last straw, their hopes turned either to separating themselves entirely from the English Church or establishing a purified church elsewhere to act as a shining example. Some emigrated to the Holland, where the Reformed faith was more firmly entrenched. Other Puritans looked to the new colonies in America. It was here in the New World that Puritanism was to reach its fullest expression outside of Scotland. After this, attempts to celebrate Christmas in the English way were punished, and Bradford noted years later that “no one had tried to celebrate Christmas since that second year.” Other American Colonies such as Massachusetts and Connecticut also outlawed the observance of Christmas and after the laws abolishing holy days were passed in England, the Colonies gladly followed with their own. Even after the Restoration monarchy forced the repeal of these laws in the Colonies in the 1680s, the practice of not observing holy days remained. While it may no longer have been strictly illegal, socially and ecclesiastically holy days were anathema. The Puritan Congregationalists, Presbyterians, and the other Dissenters of New England were all unified in their belief that holy days were an abomination, and no proper part of the worship of the people of God. This common belief was to remain in place well into the 1800s. Samuel Miller appears to be largely correct then when he declared that “Presbyterians do not observe Holy Days.” This was certainly the understanding of the first Presbyterians, it had been codified in their creedal documents, and it had been their practice both in Scotland and America for over 200 years. What then happened in the 19th and 20th centuries to change the practice of Presbyterians? The answer to that question is complex, but surprisingly it does not lie in any substantial rethinking of the underlying theological presuppositions that have guided Presbyterian worship since the Reformation. Rather, as we shall see, the increasing willingness of Presbyterians to observe holy days was ultimately the result of pressure from the laity, the movement towards the adoption of a common liturgy, and the pervasive atmosphere of pluralism, ecumenicism, and liberalism in the American Protestantism of the 19th and 20th century. America after the Revolution was a very different place from Europe, and even from the mother country she had painfully broken away from. Unlike most European countries, which had one established state church, America was simply awash in different forms of Christianity. Immigrants seeking freedom from the Religious persecution of Europe had flooded into the New World, and by the 1800s America was a nation unlike any other. A large town might have Lutheran, Roman Catholic, and Presbyterian churches and whilst these churches were initially strongly associated with the immigrant populations they served (German Lutherans, French Catholics, Scottish Presbyterians) the strong American desire for novelty and experimentation gradually began to overcome the initial distaste for worshipping outside of one’s own tradition. But while the practice of observing holy days was growing informally amongst congregants and clergy in denominations that had formally eschewed them, there was as yet no formal acknowledgement of the legitimacy of the practice. In many cases the practice of attending a church that celebrated a holy day was a guilty thrill that the individual knew the guardians of doctrine in their own denominations would frown upon. It was not until the liturgical movement, that a means was created within Presbyterianism that might have real success in gaining official recognition for the observance of the Church Year at a denominational level. This was an important distinction, for of all the documents produced by the Westminster Assembly only the Directory contained an explicit repudiation of the practice of observing Holy Days. As we have seen, Holy Days are clearly inconsistent with the idea of biblical worship as it is abundantly set forth in the Confession, but in later years the concept that biblical worship was only that which was explicitly authorized in scripture (this concept is often referred to as the Regulative Principle of Worship) was to come under attack within the Presbyterian church. Until the mid 1800s, both the Regulative Principle and tradition were usually enough to ensure that the Church Year had no place in the Presbyterian Church. In 1837 the Presbyterian Church in the United States had split into two separate camps, the “New” and “Old” school. The issues that had caused the split had to do with the feelings of ministers in either wing towards Calvinism and the traditional polity and practice of the Presbyterian church. The New School, which had been profoundly influenced by the sweeping revivals of the 18th and early 19th centuries, tended to believe that evangelistic considerations outweighed issues like strict adherence to Confessional standards. Their worship tended to be less constrained by the Regulative Principle and more inclined to incorporate elements that were to be found in the Protestant traditions that did not descend from Puritanism, or which had moved further away from their roots. Despite this tendency towards adopting new methods, the New School does not seem to have initially been any more eager than their more conservative counterparts to incorporate the observation of the Church Year into their worship. Before that could happen there was to be a more thoroughgoing revolution in Presbyterian attitudes towards worship. In 1855 a book that began to change the way Presbyterians of both the Old and New Schools thought about worship was published by a Presbyterian minister by the name of Charles Baird. Baird had been heavily influenced by the history of the continental Reformed churches, and in particular he began to discover that the Reformed tradition outside of England and Scotland had a rich tradition of using liturgies. His book Eutaxia, or the Presbyterian Liturgies: Historical Sketches, was the result of his discoveries. By examining of the liturgies used by the likes of Calvin, Knox, and the Huguenots, Baird was able to construct an argument for the reintroduction of liturgical worship into the Presbyterian Church. While Baird did not advocate a reintroduction of the Church Year in Eutaxia, and his comments on the subject where limited to an observation that even Calvin had observed Christmas on a few occasions, his work paved the way for two important developments. The first was a reassessment of the use of liturgies in Presbyterianism and the second was the opening of a window in which the practices of Reformed churches that had pursued a less thoroughgoing reformation of Worship than the Scots and English Puritans might be introduced. Both played on the growing distaste of some within the Presbyterian church for purely extempore worship. Comegys even went so far as to say that preaching was not the primary element in Sunday worship: “The grand object of the church service was prayer and praise” he hoped therefore to make Presbyterianism into “a people who express their devotions in well-ordered prayer and praise.”20 To this end Comegys published An Order of Worship with Forms of Prayer for Divine Service in 1885 and then A Presbyterian Prayer Book for Public Worship. His stated intention was to “create a public opinion which will not be startled” by the move away from traditional Presbyterian Worship according to the Regulative Principle to a more expressly liturgical and Anglican model. Both books had an impact on American Presbyterian practice that was so deep that one need not hesitate in concluding Comegys achieved his stated intention. Needless to say both of Comegy’s books included mention of the Church Year. But as yet, there was no official Book of Common Worship that would officially tie the Presbyterian Church to the observation of Holy Days. The stage had been set for the creation of such a book by the publication of several smaller books of “forms” of worship by the Denominational press – the Presbyterian Board of Publication. The advantage of creating a book of forms for worship over a set liturgy was that it seemed to tie in better with the Presbyterian practice of not forcibly determining exactly how worship should proceed. The first of these books was A. A. Hodge’s Manual of Forms published in 1877. Hodge’s manual was really quite conservative and certainly did not advocate the observance of the Church year in any way. The second of these was Forms for Special Occasions by ex-moderator of the General assembly, Herrick Johnson. Johnson’s book published in 1889 wasn’t that much more radical than Hodge’s work, but it did take another step closer to a set liturgy by including liturgical diction in prayer. While Hodge and Johnson were cautiously moving towards a more expressly liturgical format in worship, by producing books that were safe enough for the denomination to publish, private individuals like Comegys were producing other volumes that moved considerably more quickly. Eventually these two streams were to merge in the production of an official Book of Common Worship. An important agency that was to pave the way for this was the Church Service Society formed in 1897 by two influential American Pastors – Henry Van Dyke, pastor of the prestigious Brick Presbyterian Church of New York City and Louis Benson an influential Philadelphian and pastor of another prestigious church in the suburbs of that city. Both had worked extensively to privately produce liturgical materials that included the observation of the Church Year. The effect of forming the Church Service Society was to create an organization that unified the various men fighting for the institution of a standardized Presbyterian Liturgy. Most of these men were gentlemen of “pastoral, esthetic, and literary inclinations”21 and not the foremost theologians of Presbyterianism. One author observed that this was because “most of Presbyterianism’s theologians were too busy fighting in the opening engagements of the fundamentalist-modernist war and defending scholastic Calvinism to take an active part in what became a significant movement”22 While the organization stated their commitment to the Presbyterian Standards in their “Statement of Principles” it seems clear that with individuals such as Comegys on board, this commitment was to a very broad definition of these Standards in regard to worship. The group did no more than survey the practices of churches and the way in which ministers were trained concerning worship, but the effects of the surveys themselves were far reaching. They stirred the Church into concerted action on the issue of worship and led several Presbyteries, most notably that of New York, to comprehensively examine the issue themselves. The fruits of this examination where to quickly become apparent. In 1903 both New York and Denver Presbyteries overtured the General Assembly to produce forms for public worship. With Henry Van Dyke acting as the chairman of the all-important Committee on Bills and Overtures, the committee quickly resolved to answer the two overtures favorably and appointed a committee to consider the preparation of a simple common book of worship for voluntary usage in Presbyterian churches. This measure too was approved and eventually resulted in the publication in 1906 of the Book of Common Worship. While the General Assembly stressed that the use of this book was strictly voluntary and not officially recommended (the title page simply stated “Prepared by the Committee of the General Assembly of the Presbyterian Church in the U.S.A. for Voluntary Use”) it had far reaching effects – it was, after all, an official publication of the denomination. More importantly, as far as the question we are considering was concerned, it contained prayers for Good Friday, Easter, Advent, and Christmas. Barely 71 years since Samuel Miller had declared that “Presbyterians do not observe Holy Days” the denomination had boldly proclaimed that this was no longer true. Apparently the intervening 33 years and the obvious influence of the 1906 edition of the Book of Common Worship had made a world of difference in Southern Presbyterian Attitudes. It is important to note however, that the original declaration of the 1899 General Assembly was never repealed. As the Book of Common Worship continued to be revised, subsequent editions indicated that Presbyterians continued to become more and more comfortable with the observance of Holy Days. The 1946 edition included prayers for Maundy Thursday, Ascension Day, Trinity Sunday, and thirteen Sundays after Trinity. By 1955, when Northern Presbyterians were once again considering another revision of the Book of Common Worship, it had become painfully obvious that the Directory of Worship of 1788, which was still technically in force, had little or nothing to do with the actual worship of Presbyterians. Indeed it was questionable whether the Presbyterian practice could even claim to follow the Regulative Principle of Worship outlined in chapter twenty-one of the Westminster Confession, especially now that the gap between Presbyterian and Anglican worship was rapidly closing. The solution, of course, was to revise the Directory for Worship of 1788 and to produce a modern edition that would finally put an end to the need to give lip service to the principles that had guided the worship of the Puritans. Accordingly, the new Directory, published in 1961, stated that worship should draw its order and content not only from Scripture but also from the historical experience and resources of Christianity. At last the Northern Presbyterian Church (UPCUSA) had altered its theological foundations to allow for what they had already been officially practicing for over 55 years. This new directory was not accepted by the Southern Presbyterian Church (PCUS) however, and the directory they produced was far closer to the content and format of the Directory of Worship of 1788. It differed markedly from these documents however, in that it too gave a notable prominence to the Christian year, but without clearly admitting, as the Northern Directory had, that the new worship model followed by the PCUS was not strictly scriptural. In 1973 many conservative Southern Presbyterians faced with the prospect of the union of the body they belonged to (the PCUS) with the more liberal Northern UPCUSA opted instead to withdraw and form a new theologically conservative Presbyterian Church. This new church, the Presbyterian Church in America, opted not to adopt the liturgically oriented Book of Common Worship of the PCUS, its revised Directory of Worship, or any of the alterations that had been made to the Presbyterian Standards since adoption in 1789. Instead the PCA adopted the 1789 revision of the Westminster Standards and set to work on creating their own Directory of Worship. The non-binding Directory they created – while it is far more liturgical than the original Directory for Publick Worship, and includes sample forms for special occasions – does not contain a single reference to the Church year. In fact at no point in the history of the Presbyterian Church in America (PCA) has the practice of observing Holy Days been officially authorized by the General Assembly, nor does anything in the Constitution of the Church legitimate the practice. To the contrary, since the constitutional documents of the PCA uphold and endorse the original Puritan concept of the Regulative Principle of Worship as it is set forth in chapter 21.1 of the Westminster Confession of Faith, the practice of observing Holy Days in worship is logically forbidden as no one has ever been able to prove that the practice of their observation was instituted by God in His Word. What is odd in light of this is that very few, if any, members of the PCA view the observance of Holy Days as an exception to the teaching of the Westminster Standards. So while we can answer clearly why Presbyterians who belong to the PCUSA observe Holy Days, for they changed their doctrinal standards to allow for the practice, one cannot answer that question when it comes to members of other bodies that have not, such as the PCA. Their doctrinal standards clearly do not permit the practice, and yet it would seem that the majority of PCA churches observe Holy Days anyway. Why is that? Well one might be tempted to conclude that it is because the General Assembly has never tackled the subject, but the far more obvious answer is that they observe them because the Church they left observed them and the vast majority of modern evangelical churches around them observe them. In most cases no-one living can remember a time when Holy Days were not observed and most Presbyterian clergymen seem unaware that there was once a time when they were not observed. Even the oldest of PCA saints might be reasonably tempted to conclude that a notion that Holy Days should not be observed represents the thought of a crackpot. 7 Bruce C. Daniels, Puritans at Play, (New York, St.
Daniels, Bruce C., Puritans at Play, New York, St. This entry was posted in Christmas, Easter, Holy Days, Old School Presbyterian Churches, The Puritans, Worship and tagged Christmas, Easter, Holy Days, Presbyterians, Puritans, Worship. Bookmark the permalink. 40 Responses to WHY DO PRESBYTERIANS OBSERVE HOLY DAYS? Pingback: Old Life Theological Society » Blog Archive » When Did Reformed Christians Become Adventists? So your point is that John Calvin’s behavior is the standard for Christian ethics — rather than the Word of God being the only rule to direct us how we are to glorify and enjoy God? We can do what ever John Calvin did because he was a righteous dude? Nice. Jared, a quick initial question – I expect you read the post linking to mine over at the Riddleblog, but did you read the article here? I ask because you don’t appear to be interacting with anything in particular that I wrote. 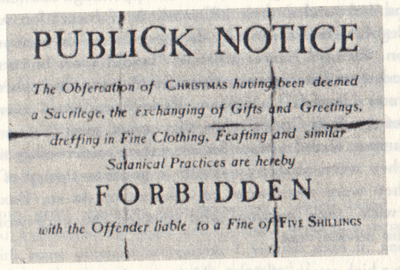 I was more commenting on the subject matter in pareticular on the attitude of the ban on preaching certain subjects on Christmas in England and Scotland in the mid-1600’s rather than your historical treatment. The extremism of an Oliver Cromwell seems to err on the other side. It was not directly addressing you nor your conclusions, no. Sorry. True, Andy, and I am one of them. Beyond a very thorough and well written piece, you have failed to demonstrate that those who observe Christmas in any way are setting aside a “holy day” other than the Sabbath. That’s where the whole thing comes crashing down. Where I would agree with you would be, say, Christmas falls on a Tuesday and the church holds mandatory services, disciplinig those who do not appear. That’s one thing. But if I choose to pause from my study of the book of Revelation next week and preach a sermon entitled Nunc Dimits, looking at Simeon’s reaction to Christ’s birth, how is that violating the RPW. It isn’t unless you want to argue that the RPW tells me what I may and may not preach about. If it does that, it becomes the same conscience binding devil it seeks to overcome. Was that directed at me? I didn’t say anything about Calvin. @revkev1967, no I was replying to Jared, that linked elsewhere about Calvin’s Xmas observance. FWIW, holidays are often the hardest thing for most people to examine impassively in the light of Scripture and the requirements of the 2nd Commandment because they are so much part of the fabric of one’s personal, family, public, and often church life. So much so that most just say “what really is the harm?” That’s easy because the harm from a human standpoint is pretty much invisible for 3 to 4 generations. However,that is what the reason annexed to the 2nd Commandment teaches, that there is harm, and it is catastrophic but because God is long suffering, we often don’t see it in our own lives. @Jared, Since you were zealous to point us to John Calvin previously, perhaps you might read his commentary on Rom 14:4-6, and then you would perhaps be more disinclined to use it to justify yourself. wow. I get a sharp cold vibe in your interaction with me. Did I offend you in some personal way? Is there a reason you suggest my true motives are personal, emotional and self-justifying? If you grew up observing the Jewish holy days, and you’re afraid to stop, because God said they were to be perpetual, then Rom 14:4-6 would be specifically helpful. Paul did not write Romans to give you license to celebrate pagan holidays syncretistically by placing a Christian veneer over them. Second, are we inviting the “righteous dude” back into the discussion? I find your dismissal of Romans 14:4-6 ungrounded. Certainly, Paul is citing this principle in regards to a particular occasion. Yet, you seem to be saying because the occasion is different Paul’s universal principle is void. Rather, shouldn’t we think universal principles apply to more than one occasion? Should we believe that Paul would have more wrath on Polycarp, a leader of the immediate succession of the Apostles for getting involved with settling the dispute over the day of Easter, that Paul would have more wrath on him than someone who continued to celebrate Passover? Paul’s universal principles that he used to address a certain occasion are also true to address other instances. Contextual application does not nullify contemporary application but informs and directs it. Just because Christmas may fall on the same day, purposefully or not, is not an argument for rejecting it anymore than because July was named after Julius who was declared a god, that all who celebrate the 4th of July or call that month July are idolators. Christians who celebrate Christmas or Easter are not celebrating a pagan holiday, just because it fell at a similar time. Where are located Andrew? I think we can hug this out. Jared, I have to admit to being a little curious as to why you are having an argument that doesn’t actually interact with anything in the post on my blog, did you have no where else to have it? This is after all a blog promoting planting Old School Churches, and I added the post on Holy Days to explain and defend the Old School Presbyterian practice of non-observance, which I trust no one would argue wasn’t their practice. The entire thrust of this blog, though, is an apology for dumping human traditions (new and old) and not allowing culture to set our agenda and lead us around by the nose. Thanks for the blog and for this reply. 1) We have a fundamentally different conception of the building up of the church. I believe that the church is built by the preaching of the minister (Rom 10:14-15, 1 Cor 1:22) not dropping Bibles. The Euthopian did not need a Bible, he needed an interpretor. Someone with just a Bible may not celebrate Christmas, but they may not understand God as Triune either. And in that duty, many good traditional formulations will be passed on that the church has used that are found no where in the Bible, (the Nicene formulation of the Trinity, The Apostles Creed, The Chalcedonian definition) that summarize and explain the Gospel. The Incarnation and Atonement/Resurrection being the two most important facets of that gospel, two times of year focused on those truths in preaching would be beneficial. These things are the heritage of the catholic history of the church, and are wheels not in need of being reinvented. 2) We have a different attitude towards history. If we are supposed to pretend that the church of the first millenium is Roman Catholic, not the catholic heritage of us all, I must part intellectual company with you. I will still wonder why you prefer the human tradition of the Confession and Catechism, but I think that is because you implicitly know with those documents that not all traditions are bad. If you do something twice, it is tradition. If you pass down terms to explain or summarize Biblical teaching, it is traditional language. Our real debate is whether certain traditions are helpful, hurtful or neutral. I suppose that’s why I wished to interact on it. Chucking a tradition because it is tradition does not seem the best way to build Old School Churches (a task I am sympathetic with). I don’t know how you intend, with an unnuanced distain for any tradition, to build and pass on a tradition of Old School Churches. May that tradition be the tradition your children don’t reject. Very interesting site. You make me examine a number of premises. I will be interacting in the days to come. Thank you for your post. As the washer-woman said to Mr. Toad “You do make my head hurt.” I don’t have a clue where quite to begin. Therefore we believe that the duty of the church is to adhere as much as she possibly can to the teaching of scripture, neither adding to it nor taking away from it. The process of *reformation* in fact, is simply the process of removing that which men have added or adding that which men have removed from the church without a warrant from scripture. While we may indeed accept and use creeds and confessions, we only do so in so far as they accurately reflect the teaching of scripture. And incidentally, I do think it is possible to be a Trinitarian without ever having seen the Ecumenical Creeds, if I thought the Trinity wasn’t explicitly taught in scripture, I wouldn’t be Trinitarian. I accept and use these creeds, BECAUSE they accurately summarize the teaching of scripture. 1) “In regard to the perfection, or sufficiency, of the Scriptures, it is acknowledged that there are some circumstances concerning the worship of God, and government of the Church in regard to which no express injunctions are given in Scripture, and which are to be ordered by the light of nature and Christian prudence, according to the general rules of the Word. The Apostolic rule in such cases is,–”Let all things be done decently and in order,”–1 Cor. xiv. 40; but this general rule does not authorise the introduction into the Church of rites and ceremonies of human invention, in order to set off the worship of God. This cannot be justified by any plea of expediency, with a view of rendering the services of the Church more attractive, and conciliating those that are without. “And it may be here remarked, that it was one of the first and greatest mistakes into which the Church fell, after inspiration ceased, to make too free a use of this doctrine of expediency. The abuses which have crept it under this specious diagnose were not foreseen. The Fathers saw no harm in an indifferent ceremony, to which, perhaps, their new converts were attached from long custom. By adopting things of this kind, the Church, which was at first simple, and unencumbered with rites, became strangely metamorphosed; and in place of her simple robe of white, assumed a gorgeous dress, tricked off with gaudy ornaments and various colours. And this practice of inventing new ceremonies went on increasing, until, in process of time, the burdensome ritual of the Levitical law was not comparable to the liturgy of the Christian Church. Who that now attends a Romish chapel on some “high day,’ would suppose that the service performed was connected with the religion of the New Testament? BTW – I note with interest you say you are sympathetic to building Old School Churches, I’m curious as to how and why you’d prefer them to say “traditional” Reformed churches. I understand that. I was merely wanting to assert that it is legitimate to argue for a different application of the regulative principle on the basis of Scripture, the broader Reformed tradition and early church history. I understand the Westminster Directory of Public Worship which is not binding on the PCA interprets that one way, though the early church, Calvin and the Continental Reformed do another. I’ll allow you to go back to being unmolested and I hope your head feels better. I find your article very insightful and helpful. Yet, as one who holds to the RPW of worship and will not take any exceptions, Lord willing, at his licensure and Presbytery exams I still believe it is possible to have a non-binding time of thanksgiving and prayer and still be within the bounds of the RPW. I say this because the activities being prescribed (i.e. prayer, thanksgiving, the singing of psalms and spiritual songs), at least in the way I would observe a “holiday”, are prescribed by Scripture. However, I would never pit these times of thanksgiving and prayer against the sanctity of the Lord’s Day. Only the Sabbath is holy. Holidays or these times of thanksgiving and prayer are a part of secular time and it is not improper to give thanks on other days that are not the Sabbath. Also, when you mentioned the liturgies of Calvin, Knox, and the Huguenots I got very excited at the prospect of hearing a pro-liturgical position from men who are widely respected in the reformed faith. However, you ignored the valuable insights of these men completely and instead presented a straw man, Henry Ward Beecher, the most ardent Universalist Unitarian that comes to my mind. No orthodox Christian would affirm anything that Beecher taught, so you’re referencing heretic only paints adherents of holidays into a corner. I would also remind you that it was George Gillespie’s intent that the Doxology, responsive readings, funeral services, and the recitation of Creeds in worship be abandoned. I am sure that no one would argue that we get rid of these practices even though they were not instituted by God himself. Andrew, A very encouraging post encouraging us to walk in the old paths. May God bless it. The paragraph with the number 17 footnote in it twice could use some editorial regulation to bring it into compliance! Are not the traditions of man and in fact the sign of the ‘kingdom of man’; Babel? From whence we derive Babylon? My point is any ‘traditions’ or other man made additions or subtractions from God’s given ‘order of worship’ is a sin and a product of false worship. To be avoided at all costs! Thank you for the hard work that obviously went in to preparing the article. While I am not ready to throw in the towel on Christmas, I believe I understand your point of view. Thanks for filling in many gaps in reformed tradition. Is Ellisville Pres observing Christmas this year?